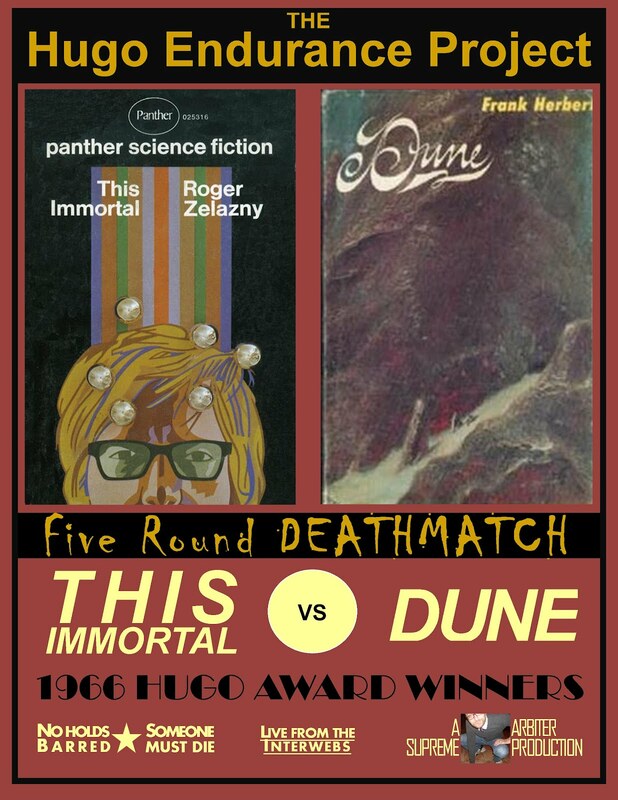 Okay nerds, here it is: The 1966 Hugo Award DEATHMATCH. Finally the world can have some closure knowing which of these books was actually better than the other. Each round I’ll tackle a different element that I didn’t write about in the reviews but were significant issues for me when I read them. Some of these rounds will probably be longer discussions than others, so each day I’ll take a round or two or three with a day or in between until I finally get to THE DECISION which will be the final word on these two. There will be no points, but ranting and bluster and… okay maybe there will be points. But they will matter less here than in normal reviews and they will probably be completely arbitrary and mostly capricious. Please chime in, throw tomatoes and give me your two cents over the next couple of days (or paypal me your 10,000 cents). I will absolutely (well...maybe) consider any comments in my decision, especially if I’ve missed something so get in on this! My favorite quotes from each, pitted against one another with weapons strapped to their feet in a dusty, dirt-floored, open air building with a crowd waving dollars around and screaming. It’s like a cockfight for SF Quotes. Makes sense right? Everyone has read at least one book with a peripheral character that they loved. I’ll tackle that here if necessary. This could also deal with the hero’s relationship with another character, plutonic or otherwise. Awww…. Heroes and their best friends – cute! How enigmatic are your evil dudes? How nefarious your villians? Are your bad guys sweet? Do they have skillz? Bonus points if they do. Both of these novels are set in desert/wasteland environments. Which was most oppressive/dangerous? Where were the coolest creatures? I guess I should sum it all up and add any miscellaneous comments I can and then I’ll make the announcement. K. That’s about it. So officially, them’s the rules. I’ll try not to abide by too many of them and I hope you’re as excited as I am. Oh yeah, looking forward to it!